EA: Medal Of Honor "Didn't Meet Our Quality Expectations"
For all its pre-release swagger and marketing might, EA's recent Medal of Honor reboot, well, sucked. I think so, many of you think so (though not everyone! ), and now even staffers at Electronic Arts are getting down on the game. "I'm not going to comment on the sales because EA has an earnings report going out next week and we will unveil sales in that meeting", EA Games' Patrick Soderlund told Eurogamer. "What I can say is the game didn't meet our quality expectations. In order to be successful in that space, we're going to have to have a game that is really, really strong." "Medal of Honor is to some extent judged harsher than it should be", he then adds in the game's defence. "The game is better than today's reviews are indicating." No, it's not, and that's being kind, because I think Medal of Honor was a double failure. Yes, it failed as a modern-day shooter thanks to confusing jargon, a boring plot and woefully-implemented AI scripting. But even more importantly, it failed at what it was initially pitched as being: an "authentic" military action title. What we were promised was a game that put us in the shoes of a Western soldier in Afghanistan, a conflict that's as much about dealing with civilians and "allies" as it is putting bullets in bad guys. The game even made a big deal of the apparently vital involvement of a number of serving members of the US military. What we got was a game where you walk, run and sometimes drive down corridors shooting everything in your path. It could have been set in space and starred an alien, it could have been set in the Second World War and had you playing as a Brit, and the experience would have been transferable. EA had a chance with Medal of Honor to really throw a stake in the ground. 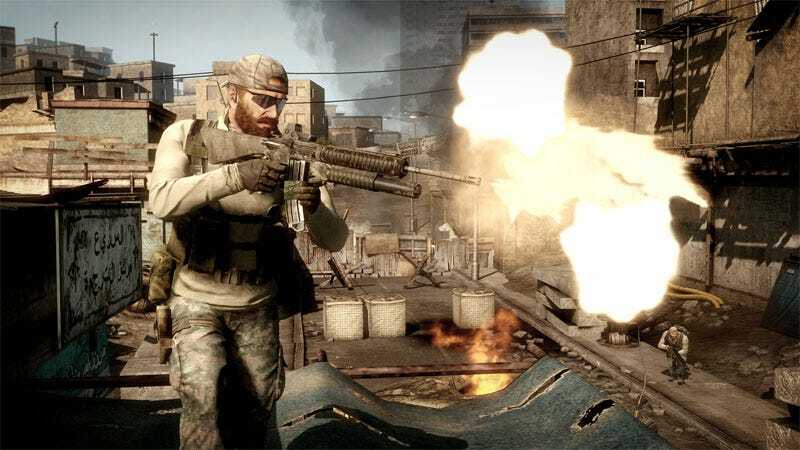 To show that by setting a game in a controversial, contemporary conflict that a shooter could be as much about a soldier's actual experience as it was about video game cliches of spawn points, headshot streaks and sniper levels. And it failed.